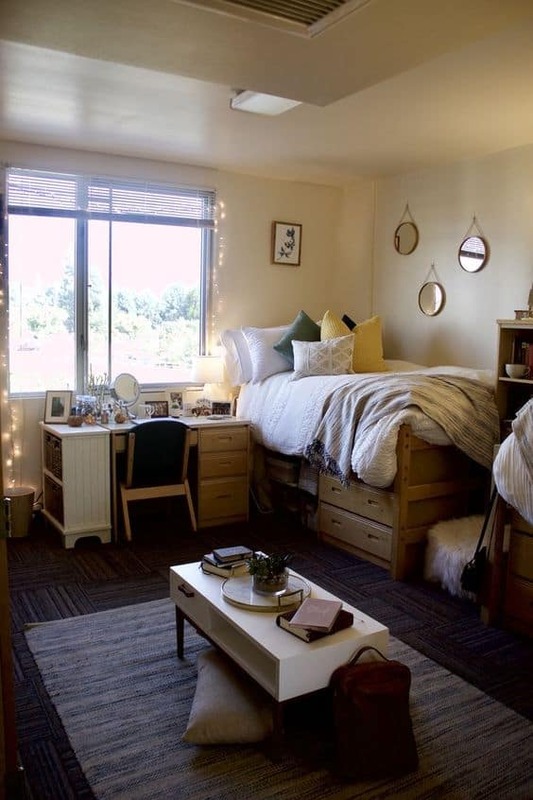 This post is all about dorm room ideas. 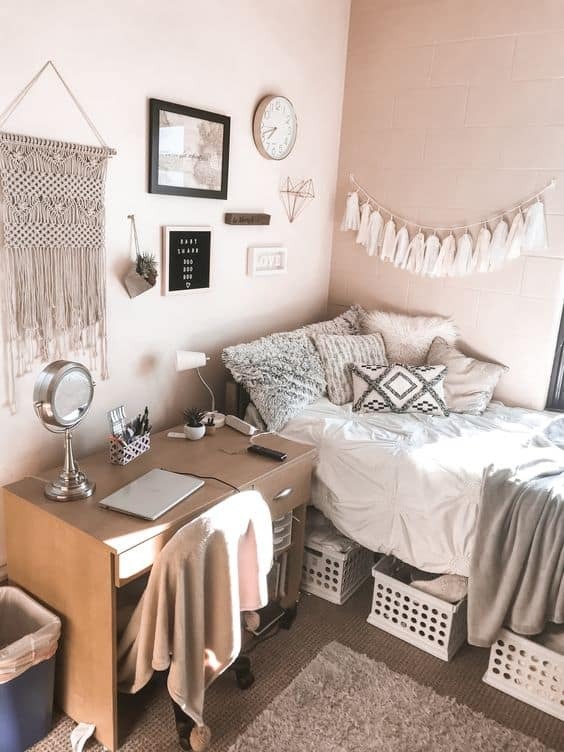 Having a cute dorm is a must but finding dorm room ideas that actually make that blank and boring room cute is HARD! When I saw the dorm room I was moving into my freshman year, I was honestly shocked at how ugly it was. From the linoleum flooring to horrible drapes, there was a lot of work that needed to be done. I sat on Pinterest for hours looking up cute dorm room ideas. With all that searching, I've found the best ideas that all freshman should know about. 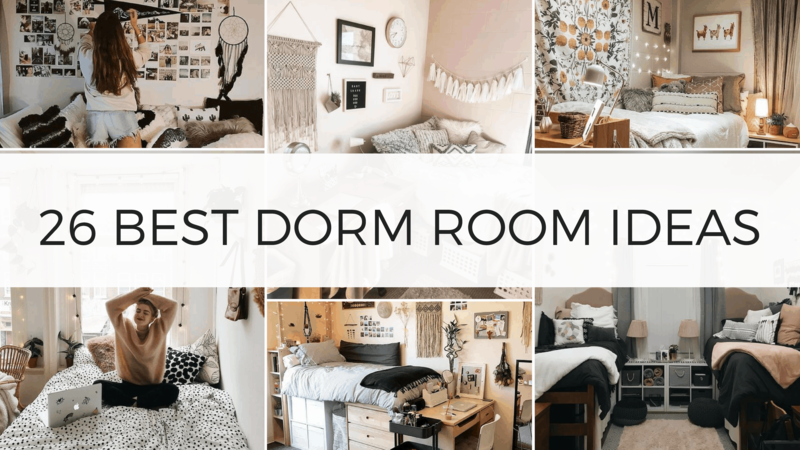 This post shows you the 26 best dorm room ideas to give you inspiration to have the cutest dorm on campus. This dorm room idea helps you save space and provide an extra area where friends can sit when they visit! 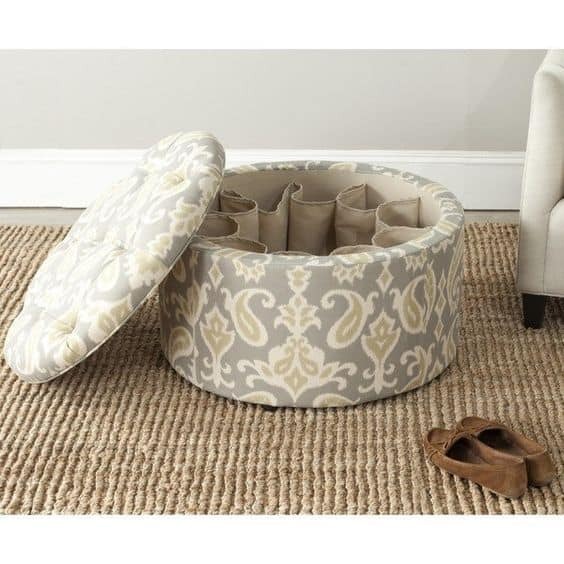 A shoe storing ottoman is the way to go because it does so many things in one, you can't go wrong with this dorm organization idea! Jewelry is one of the hardest things to properly organize and store, as a result a lot of can get lost. Save yourself the grief by copying this smart dorm room idea. 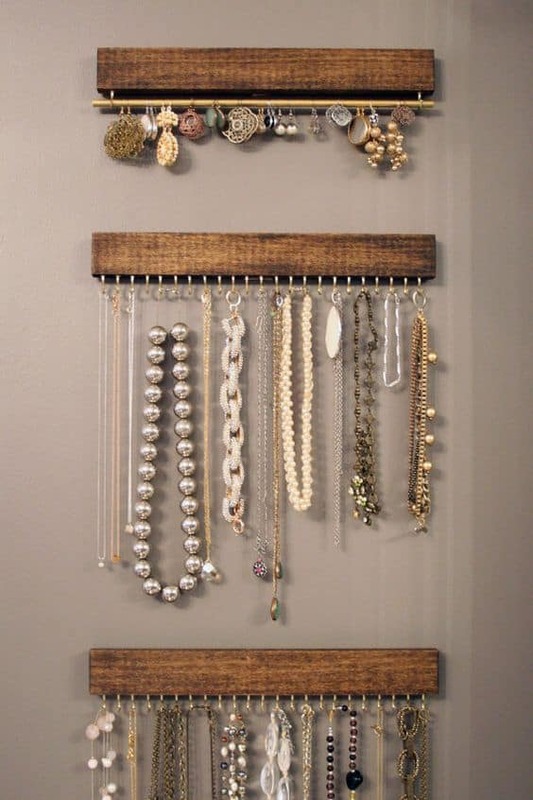 This jewelry organizer is light enough that you can hang it with command strips! Perfect for a dorm room. 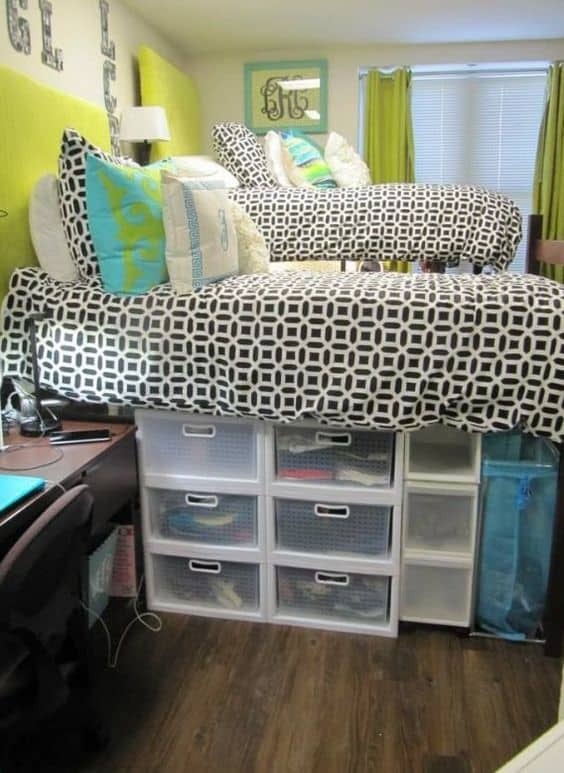 Closet space is limited in the dorms, so make the most of it with this genius dorm room idea! Just get some chain links and use them to link together hangers. 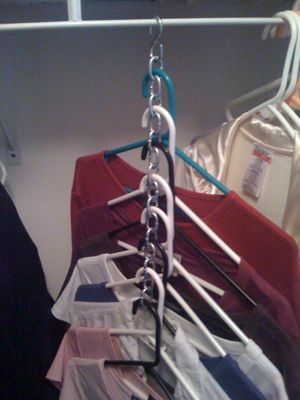 Use these hanger links to store similar items such as t-shirts or dresses. This dorm room idea is a life, and space saver! 4. Bins, Bins, and more Bins!! One thing you will find when moving into a dorm is that there is not enough space. Solve this problem by using bins, bins, and more bins. For papers, shoes, sweaters, anything you can think of, think of a way to put it into a bin. This dorm room idea saves so much space, trust me! 5. Loft (or at least lift) Your Bed! If you keep your bed in its original position, it will take up 95% of the room and leave you with barely any other space to put your things. 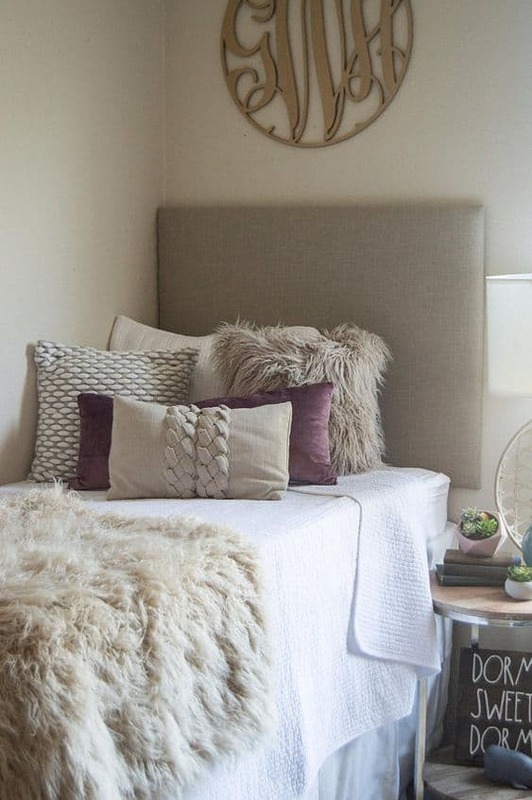 Optimize space by lifting or even lofting your bed to be like a top bunk! While it might seem like a hassle, it creates so much more space for futons or storage that in the end, you will be so thankful you did it! I did this both years I lived in the dorms and I couldn't imagine doing it any other way! 6. Coordinate with Your Roommate! 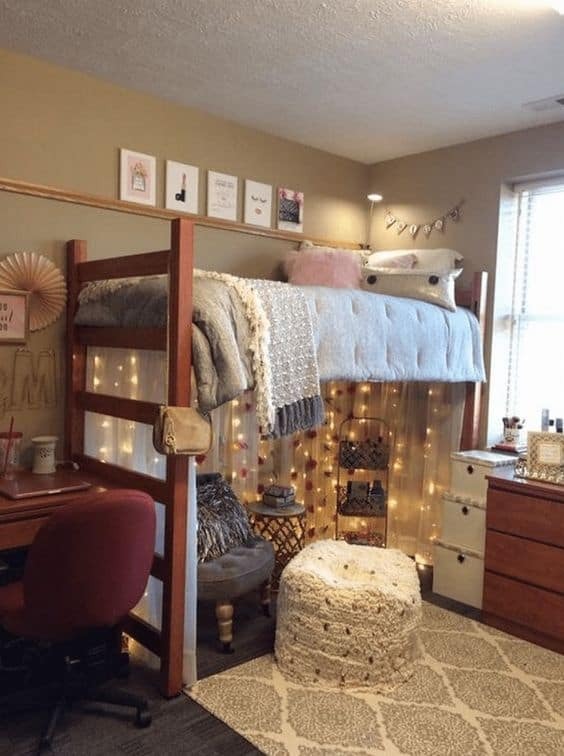 For girls especially, the desire is to have the CUTEST dorm room! For parents, that sounds super expensive! Keep costs low and the kids happy by having roommates coordinate their decor with each other. Doing so allows for each to spend what they want, but still create a cohesive and cute space for their school year. Some great ways to coordinate are by color or print, just match a few things within the dorm and yours will be the talk of the building! Ok real talk, nothing is nastier than the linoleum flooring in a dorm room. Like, nothing. One of the greatest dorm room ideas someone ever gave me was to purchase a rug that would cover up essentially everything. Not only was it easier to keep clean, but it also gave the room a pop of color and decoration! So get a rug, you'll thank me later I promise! Another incredible dorm room idea is to buy a futon. I know space is limited but if you can find the space (especially by lofting your bed like I mentioned before) you need to buy a futon. Futons not only give extra sitting space for guests, but they also great a guest bed should you and your roommate have visitors. And even when its just you and your roommate, a futon keeps you out of your bed so that you can stay awake while watching TV or doing homework! This is the futon I bought freshman year and HIGHLY recommend. 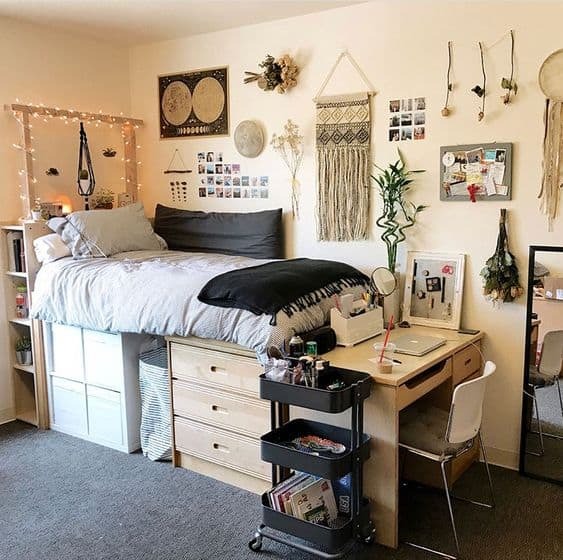 A great dorm room idea that optimizes space and costs essentially nothing is to push your desks together on to one side of the room like in the picture above. This opens up one side of the wall completely and thus gives you space for a futon or anything else you might need. Plus, it makes those late night study session so much better because you have a buddy sitting right next you going through the same thing! 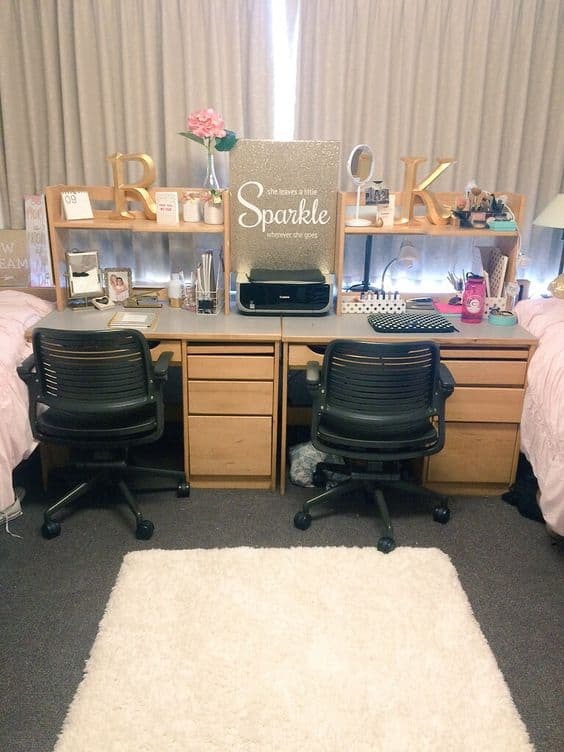 Keep with the dorm room ideas that involve desks, purchase or build desk hutches to go along the back of your desks! 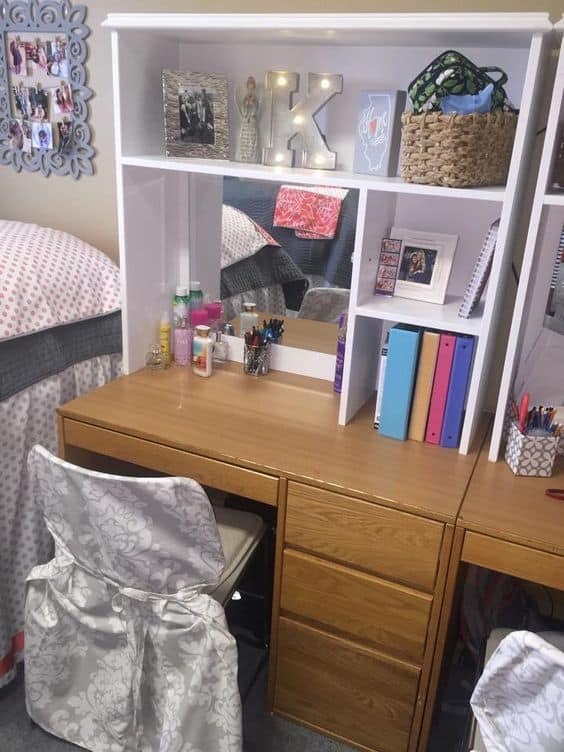 This dorm room idea gives you so much storage space within the actual dorm because it creates organization options for everything related to school. Tip: Push desks together, put desk hutches on top, the futon on the other side and the TV on top of the hutches and viola! 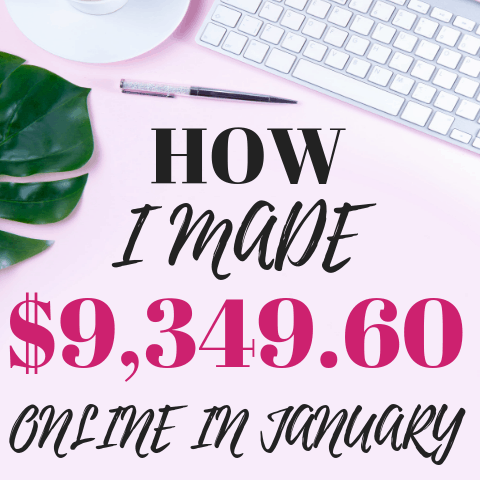 you've created a study space AND a den all in one! 11. Use Lamps to Brighten the Room! The overhead lights of a dorm room are HARSH, and dorms are not likely to give you lamps. So please, bring your own. 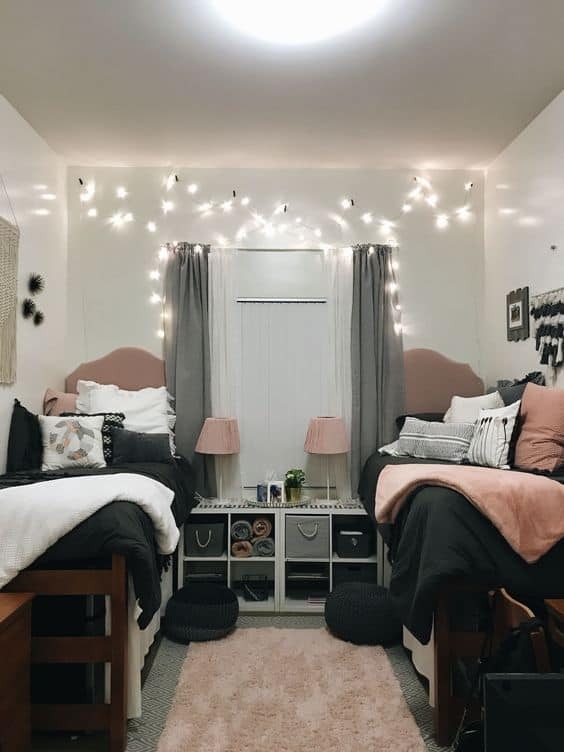 This is a smart dorm room idea because it provides the option of better, and much softer lighting that will save you many headaches throughout the year. And, if your roommates an early rise and you're not, or vice versa, a lamp is great way to keep the peace and not wake each other up! Another great lighting option is to purchase twinkle lights and line them along your walls! 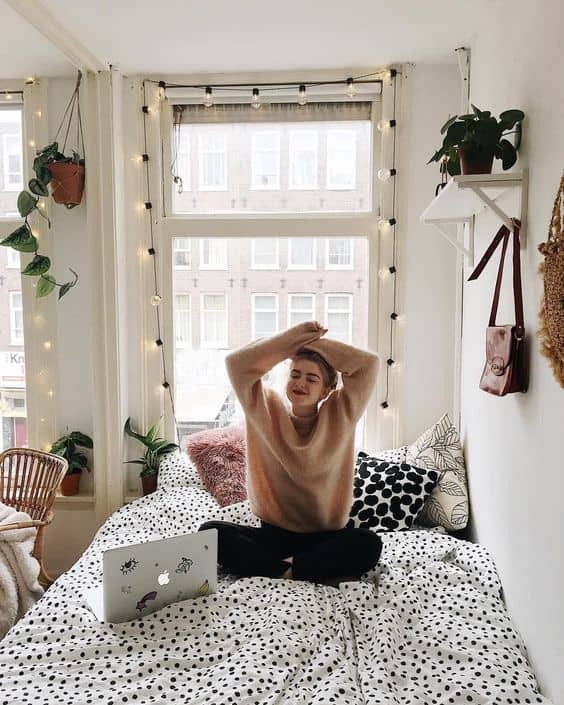 This dorm room idea creates a relaxing ambiance that allows you to take a break from studying every once and a while! Most dorm room walls are cinder blocks, and give off a very prison like vibe. Erase any idea that you're in prison by adding wallpaper! 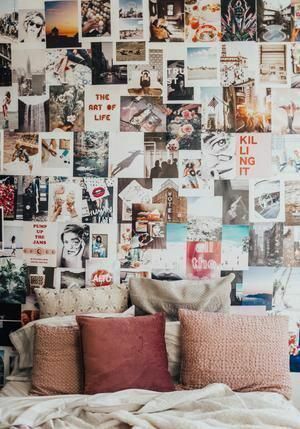 This is becoming very trendy in the realm of dorm room ideas because easy application wall paper is becoming very popular. There are solid colors or subtle prints, either way you can't go wrong, but I highly suggest purchasing some wallpaper to liven up your dorm room for sure! The inside of drawers in a dorm room can also be very nasty. 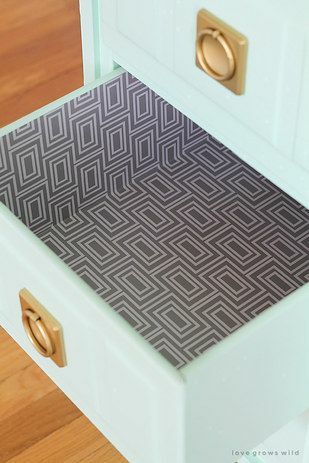 Keep your stuff clean by lining the bottoms with contact paper! My mom did this for me when we moved into my dorm and throughout the year it was such a life safer because it was something cute, and also clean, to open up whenever I needed anything! A super simple, yet cute dorm room idea is to implement a color scheme throughout your dorm room. This is a great opportunity to coordinate with your roommate like we talked about above. 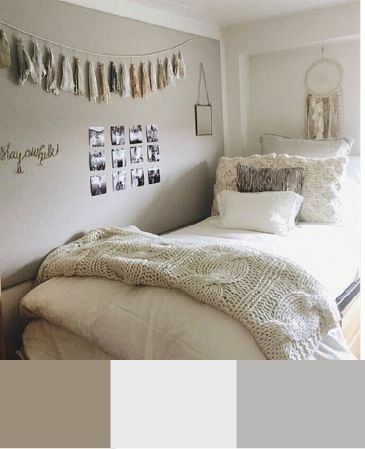 Implement those colors in your beds, pillows, rugs, and wall decor for a very cohesively cute dorm! Ok I know this sounds ridiculous because you would think that a coffee table would take up a ton of space. It takes up space, but it serves such a great purpose that it doesn't matter. A coffee table, especially one with storage underneath, is a great dorm room idea because it allows for one to store books or anything really in a central location so that if anyone needs it, its there! It's also great for eating food on in front of your TV should you want a flat surface but not want to eat on your desk. 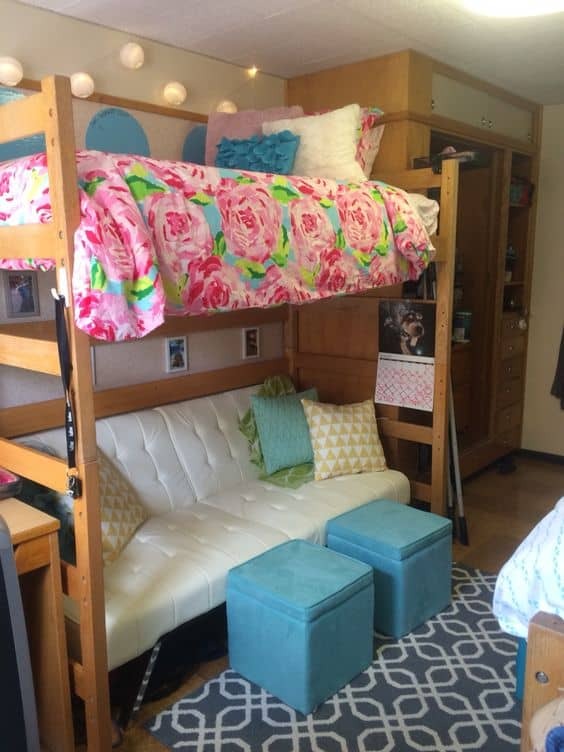 This dorm room idea is genius, especially if you are lifting your bed at all. 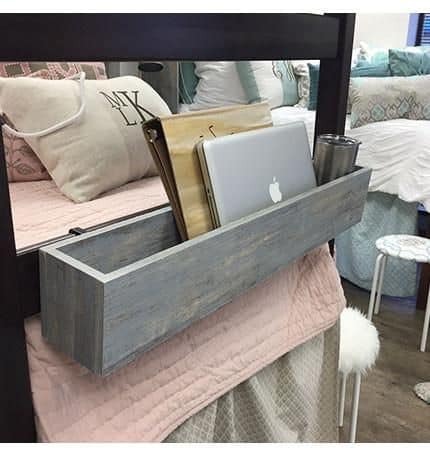 A bed rail cubby hitches to the side of your bed and allows you to place your laptop or phone or book in it before you drift off to sleep. And, some of them even have holes in the bottom you can loop chargers through. Seriously, this dorm room idea saved my life freshman year, I 12/10 suggest you buy! 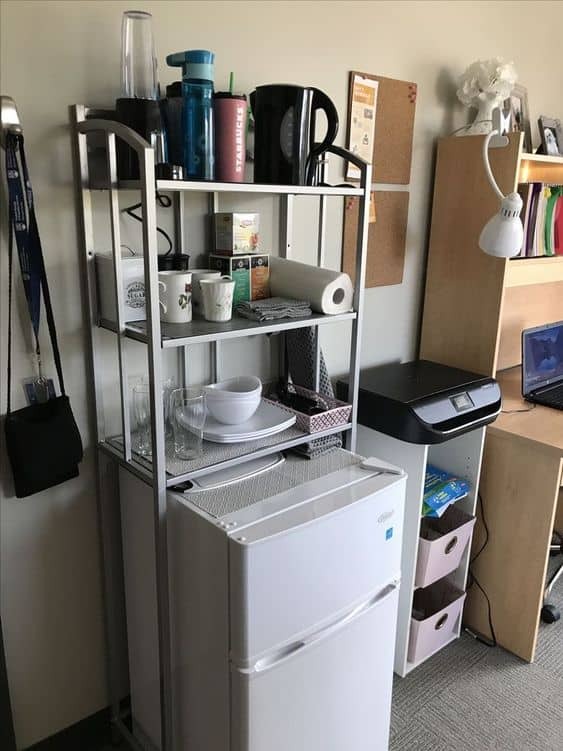 A great way to include a refrigerator and microwave into your dorm room in a way that optimizes space is by buying or building a bedside table that has space for those as well as cubbies within it. Doing so allows you to create a flat surface to lay things on, but also optimize your storage of food or coffee! 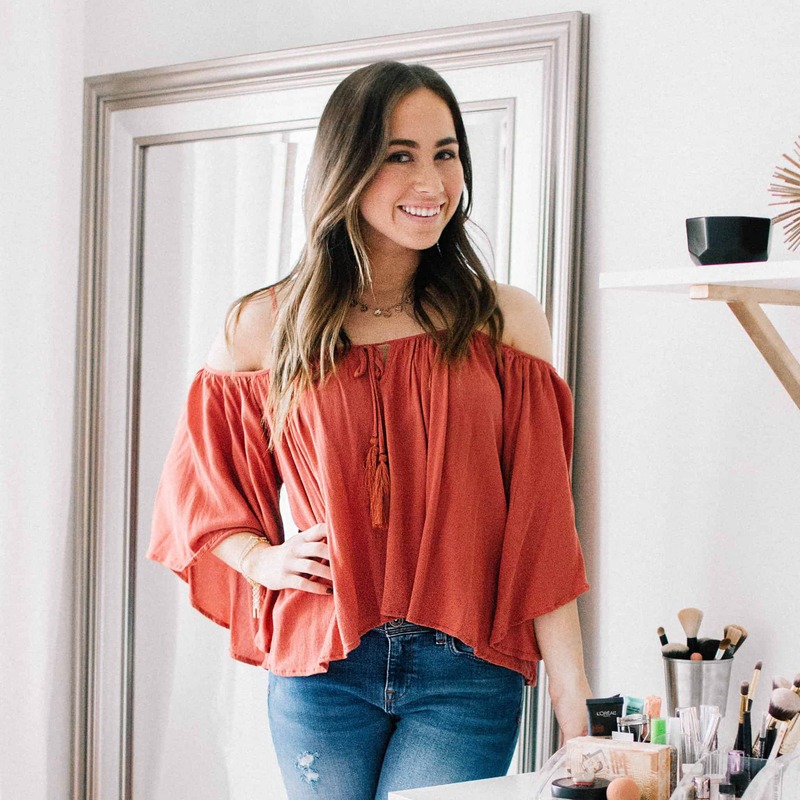 Closets are so tiny, and college girls are convinced that they need every item of clothing ever freshman year, so closet space can easily become a problem. Using velvet hangers allows for so many more clothes to fit in your closet. Doing so allows you to optimize space and fit more clothes you'll never wear ;). If wall paper isn't your thing, buy a fun wall tapestry for your dorm. This is a cute and inexpensive dorm room idea that uses up wall space and creates decoration in a super simple manner! Another desk option is to put each desk at the end of the bed. This dorm room idea keeps things separate between you and your roommate, but in a space-savvy way. It can also be a great way to get into your bed should you choose to lift it! Turn your small space into an apartment like dorm room with this idea! Use the space above your fridge to organize all of your food supplies. This dorm room idea implements a color scheme and creates a super cute space! Stick with a solid color and use it in your your bedding and pillows. 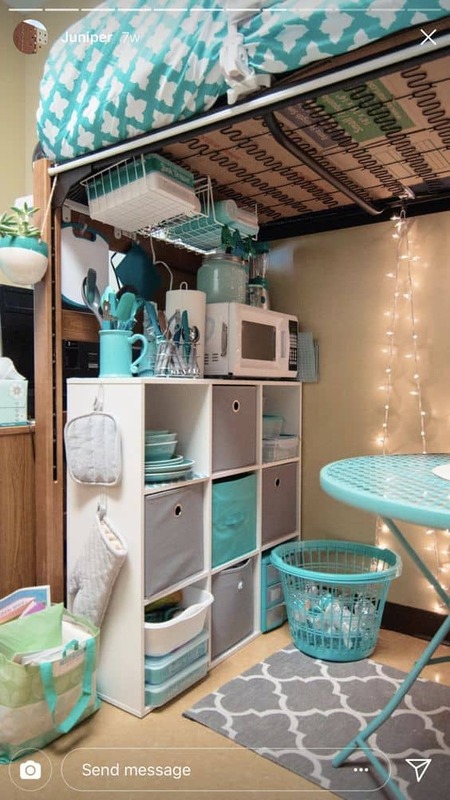 This creates such an aesthetic, Instagram-worthy dorm you can take pictures of all year long! 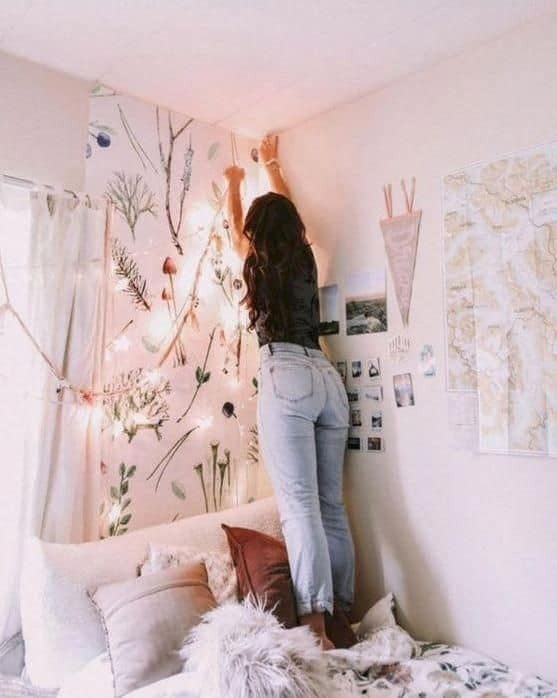 Hanging pictures is a great dorm room idea because it decorates your dorm and uses wall space all in one! Another great way to use wall space and personalize your dorm room is by hanging photos. 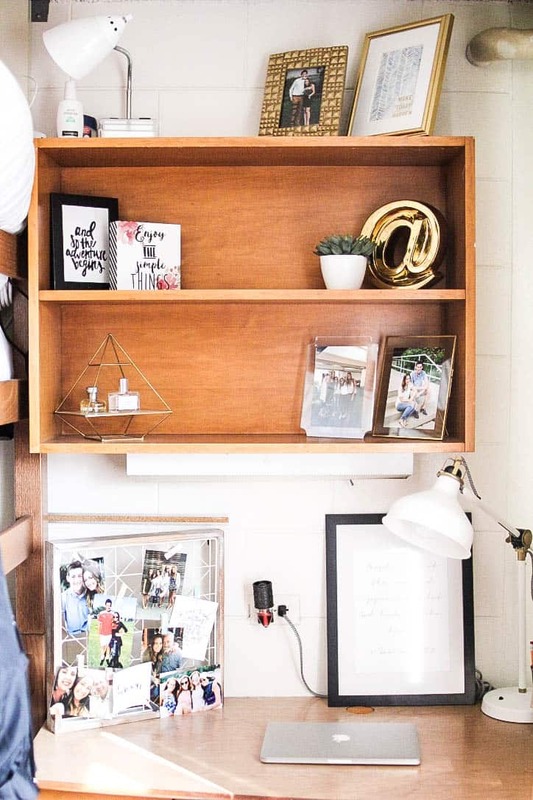 This is a clever dorm room idea because it makes the dorm your own while also being decor. It's a 2 in 1 that you'll be thankful you used if you get homesick! 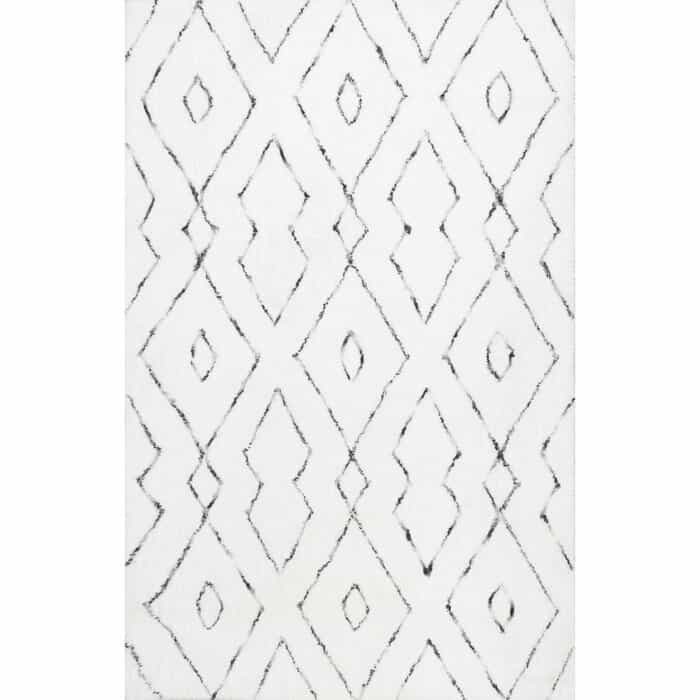 Ok, even if this doesn't match your headboard, you HAVE to buy this blanket. 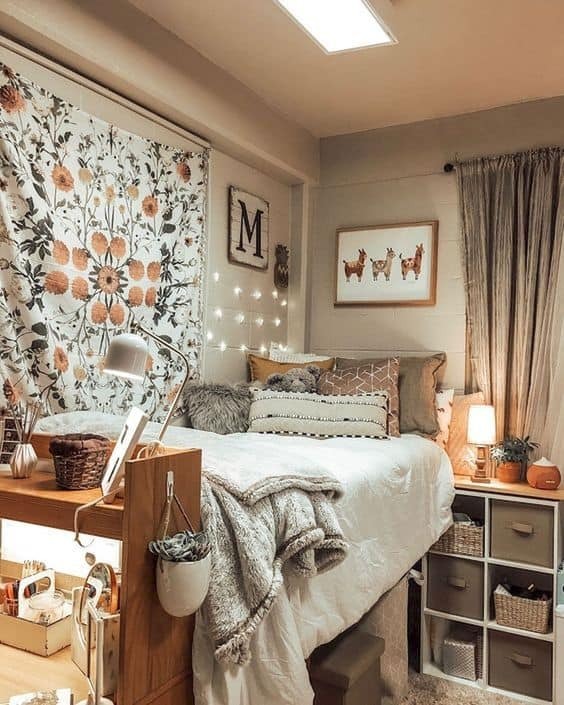 This post was all about the best dorm room ideas.